Some people have a spirit which is naturally inclined to fight and overcome hurdles, while others might need to work a little harder at it. Someone with a fighting spirit is often strong-willed and unafraid to get a little bit aggressive when need be. 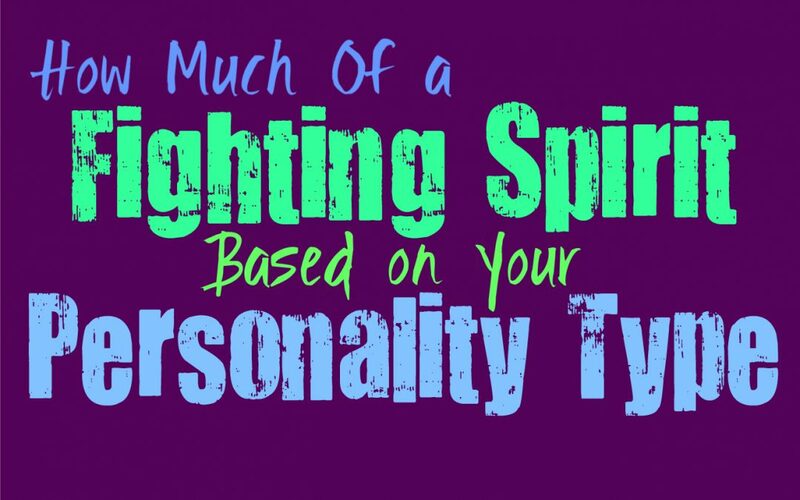 Here is how much of a fighting spirit you possess, based on your personality type. INFJs are the type of people who can easily be underestimated by others, but in truth they have a powerful fighting spirit. They are passionate people with an incredible depth of emotions, and this helps them to really fight for what they believe in. INFJs are capable of great strength which is something most people overlook or simply do not expect from them. Because of their complex minds and powerful inner emotions, INFJs are often faced with greater challenges in life and still find a way to remain moving forward and showing compassion for others. ENFJs are strong-willed people who absolutely possess a great fighting spirit. They don’t allow things to stand in their way and always seem to be capable of overcoming adversity. For the ENFJ it seems to come naturally that they will fight and continue to push ahead even when life is trying to hold them back. ENFJs aren’t afraid of taking on challenges and often have this fighting spirit which inspires them to work hard in order to accomplish their goals no matter what. They also fight for their loved ones in a way that is truly beautiful. INFPs are often a bit more laid back with certain things, and so their inner fight might not be so obvious to others. INFPs might be capable of fighting for what they believe in even if it seems a bit like a challenge. While INFPs do possess a fighting spirit deep inside of them, it isn’t something they tap in to all of the time. They would rather things be more peaceful in their lives, than constantly having to face discord and struggles. They often have so much going on inside of their own inner minds, that they don’t really possess the outward emotional strength to deal with things that don’t really concern them. ENFPs definitely possess a strong spirit which is willing to fight for the things they want. While ENFPs will definitely do whatever it takes to accomplish their goals and obtain the things that mean the most to them, they don’t necessarily go looking for a fight. When it comes to facing discord with loved ones or in situations they would rather make peace, the ENFP might be more inclined to shut down. Their inner fight only comes out during time they truly need it, and not for just anything that seems to stand in their path. INTJs definitely possess a fighting spirit, and they aren’t afraid to make good use of it. They are often very strong-willed people who are willing to do whatever it takes to accomplish their goals. INTJs believe in efficiency and removing ignorance from the world, and so they strive to always be learning and improving. For some people their sense of aggression and willingness to fight, is a bit unnerving. This simply comes from their passionate souls and their desire to really make a difference in the world in the most logical way possible. ENTJs absolutely possess a fighting spirit, one that isn’t afraid of making its presence known. They will do whatever it takes to accomplish their goals and can sometimes be a bit aggressive in their efforts to get things done. ENTJs don’t stand for excuses and simply do what they must be efficient and remain focused on the future. They don’t enjoy sitting around waiting for things to happen, instead they are willing to stand up and fight for what they want. They will certainly take on any challenge that comes their way, with a sense of fight and strength. INTPs don’t necessarily have an outward fighting spirit, since they are such cerebral people. They can be so focused on their own inner minds that they really lose sight of what is going on around them. While INTPs might not actively seek out a fight, they are willing to logically find a way to solve the problems at hand. If some sort of fight comes their way, INTPs are often good at navigating them but this often leads to diffusing the situation rather than pushing through it. They use their minds to get through things in life, instead of simply trying to fight their way past their struggles. ENTPs definitely possess a fighting spirit, mostly because they aren’t afraid of a little discord. ENTPs don’t run away from a challenge and are often willing to face things head on. They even enjoy getting into heated debates with people, and so this does come from a combination of their curious minds and their willfully fighting spirits. They sometimes enjoy getting into a bit of trouble, since it often inspires them to learn and in the very least shakes things up a bit. ISTJs most certainly possess a fighting spirit, but it often steers them towards efficiency and getting things done. While others might be afraid to reach out and grab the things they want, ISTJs are willing to fight for it with both hands. They realize that in life they might encounter struggles and discord, and they are more than ready to handle these situations. ISTJs do what they must to get the job done as efficiently and morally as they possibly can. ESTJs definitely possess a fighting spirit, one which propels them towards the goal line in their lives. They do whatever it takes to get things done and achieve the things they want, even if that means a serious fight is on their hands. ESTJs are willing to take on these challenges and really they aren’t afraid to fight for it or even with others to obtain it. They are strong-willed people who possess a fighting spirit and a will to surpass those around them. While ISFJs might not appear to be fighters on the outside, they often possess a quiet strength within them. For the ISFJ it is not so much a fighting spirit, as it is a strength of character and a willingness to protect their loved ones. They can be fierce people if they are provoked, but this isn’t something most will actually get a chance to witness. In most cases the ISFJ is simply kind and hardworking, doing whatever they can to provide for others and themselves. ESFJs often possess more of a fighting spirit within them than most people actually realize. Their fighting spirit often comes from their desire to take care of others, and they can become fierce when trying to defend the ones they love. ESFJs will do whatever it takes to protect those around them and so they always strive to make them truly happy. They will often push themselves and will fight for others in a way that clearly comes from deep within them, and shows quite the strength of character at times. ISTPs are definitely independent people who enjoy living their lives day by day, but at the same time they do possess a strength inside of them. ISTPs often have more of a fighting spirit than people realize, since they are willing to go after the things that matter to them. When it comes to misinformation ISTPs can become very bothered by this, and so they are willing to fight in order to spread the truth when they have the opportunity to do so. ESTPs definitely do possess a fighting spirit, one which is willing to overcome anything in order to get what they want. They definitely are willing to fight for the things they want and can get a bit intense when they are going after something. For the ESTP it is more about allowing themselves to go after what they want and really feel capable of experience their passions in life. They don’t like being held back and sometimes this means they are willing to get into a bit of a fight for it. While ISFPs are passionate people who are willing to go after what they want, they possess a much more sensitive spirit than people realize. It can often be challenging for them to deal with constant hurdles, especially when it comes from people who are supposed to support them. ISFPs would rather have peace and love in their lives, than constantly feel like they have to come up against some sort of fight or struggle. ESFPs might seem like strong-willed people, but deep down their spirit is much more sensitive and warm than it is full of fight. While they are willing to go after what they want and be aggressive in order to achieve their goals, ESFPs are truly sensitive people. Their hearts are filled with love and so they often find themselves getting hurt fairly easily. They don’t like having to fight others for something and instead would rather have people who work with them.